I am sure he will get over it.. when is grown. Hopefully he is occupied enough during the day to be too tired to thinka bout it at night. I was always afraid of dolls, and I never liked to play with them. And I am a female, I just did not like the way they looked...this must sound weird, but I understand why your son was afraid. You did the right thing by sending the elf back, and hopefully he will soon forget about his bad experience. Your story reminded me that my mother used to have a ceramic elf that she made on top of our frig. My younger sister and I always thought that it moved and that it would give us the evil eye. , but recently we were cleaning out my mother's house and my sister said to me "Whatever you do, get rid of the evil elf". Usually I would have teased her, or put the elf on her doorstep, kidding, but I was amazed that she still remembered that and that she was still afraid of the ceramic elf. Maybe elves are just scary creatures, for whatever reason. Edit to add-she only remembered it because we had it for years. I am sure that if it was only there for a short time, she would have already forgotten about it. Wow, hilarious story. Reminds me of me when I was that young. Therapy though? Hell no! It's just one of those things that eventually happens. When I was very young, I saw a worm come out of a dead termite... It traumatized me and I was afraid of termites for months afterwards. Maybe you could sit him down with a print out of the creepy Elf and fully explain it's purpose - so he has no doubt that it is just manufactured in some factory. Honestly it shows good character of your kid, he's awesome! Kids *should* be like "Whoa, that's creepy. You mean this little damn thing is gunna watch what I do and report back to some bearded guy across the world?" I really like the elf on a shalf as does my daughter. We watched the cartoon before we got the doll. Maybe thats why it isn't very creepy to me or her. The cartoon I thought was rather cute. 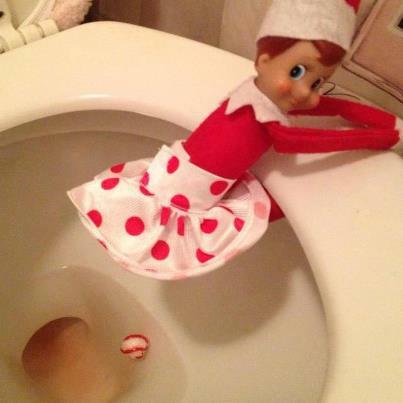 I've known about the elf on the shelf dolls for awhile now. I always play the hot coco game on the website for it. However, I have to admit that those dolls do look creepy looking. The idea behind the elf on the shelf is also creepy knowing that it watches you to make sure that you are good. That's not only creepy but that's stalking and grounds for being burn in a oven. Just seems like a way to get kids paranoid. Or to get used to being monitored by some nonexistent pair of eyes. Who needs a church, when you've got Shelf Elf! Order now for 9 easy payments of 9.99! Big Brother got you down? No problem! Shelf Elf is here to condition your child: Today! ...But seriously, we're all doomed. I made the mistake of Googling Elf on a Shelf. Call me sheltered sometimes but Id never heard of them before. Well, I then made my big mistake. I clicked 'Images' to see what such an elf might look like. I think I lost count of how many images I now need to work on UN-seeing and the various creative ways people have found to pose their elves..... Oh .. Goodness.. Some people have FAR too much time. Anyway... It sounds like quite a pickle with your son. Talk about a great idea with all the best of intentions turning into a childhood trauma no one saw coming. Even the Easter Bunny is good for a few felonies by the end of that version.... I think the elf trauma will fade with time tho. I like the idea of watching the cartoon with your child and if that's something their into...go for it. If not drop it like it's hot.